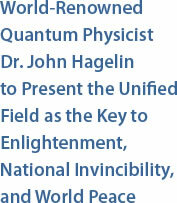 A unique new 12-part videotaped conference series, entitled “The Unified Field: The Key to Enlightenment, National Invincibility, and World Peace” and featuring world-renowned quantum physicist Dr. John Hagelin, was launched on February 4, 2008, in cities throughout the United States and around the world. The Unified Field, according to modern physics, is the deepest, most powerful level of Nature’s functioning—and the source of the infinite creativity and intelligence within every individual and displayed throughout the universe. Dr. Hagelin, who conducted pioneering research at the European Center for Particle Physics and the Stanford Linear Accelerator Center, will present the scientific discovery of the Unified Field and its practical applications in every area of society to eradicate such intractable problems as violence, disease, and poverty. Dr. Hagelin also reveals how these same technologies of the Unified Field, which include the Transcendental Meditation program of Maharishi Mahesh Yogi, can raise every individual to enlightenment and every nation to invincibility. The public is invited to attend all conferences. 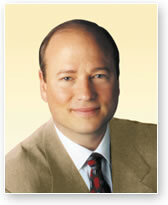 Dr. Hagelin currently serves as Executive Director of the International Center for Invincible Defense in New York City; International Director of the Global Union of Scientists for Peace; President of Maharishi Central University in Kansas; Minister of Science and Technology of the Global Country of World Peace; and Raja of Invincible America.